For the second time this year, we are setting out on a working vacation, retirement style. The deal involves trading volunteer hours for lodging in a unique setting. Last winter we worked at Snow Mountain Ranch in Colorado. 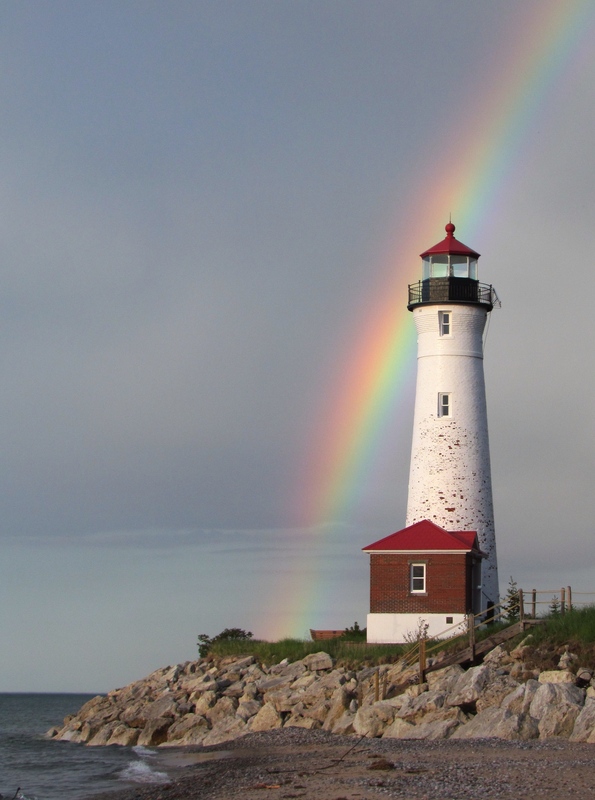 This time our destination is Crisp Point Lighthouse in Michigan’s UP near Whitefish Bay. 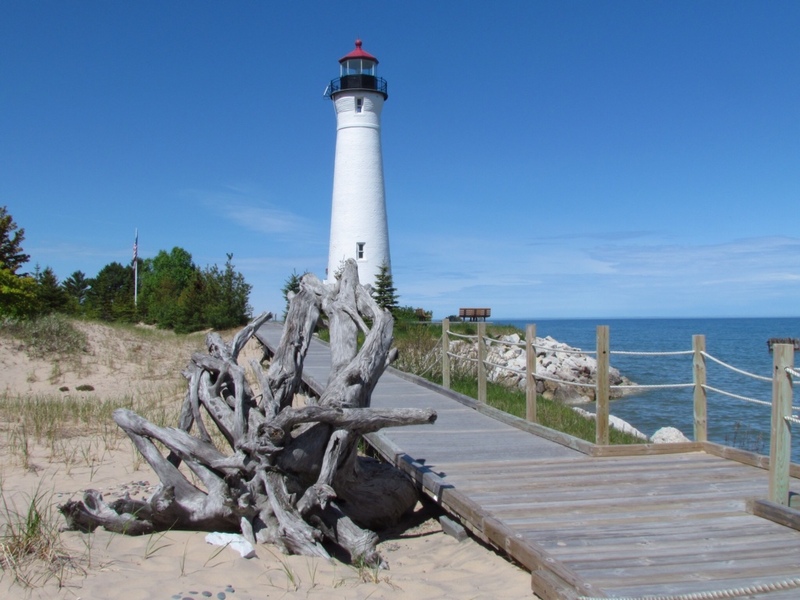 This lighthouse is one of five positioned between Grand Island and Whitefish Point. 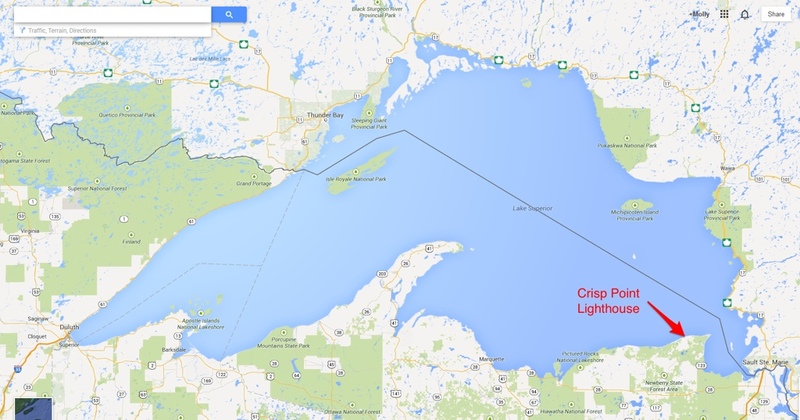 It’s only a distance of about 50 miles, but Lake Superior claimed numerous ships in this stretch in the 1800s, leading to its moniker as “The Shipwreck Coast.” Pressure to build lighthouses began in the 1850s but it was 1904 before Crisp Point finally received funding and became operational. It remained in service until 1993. 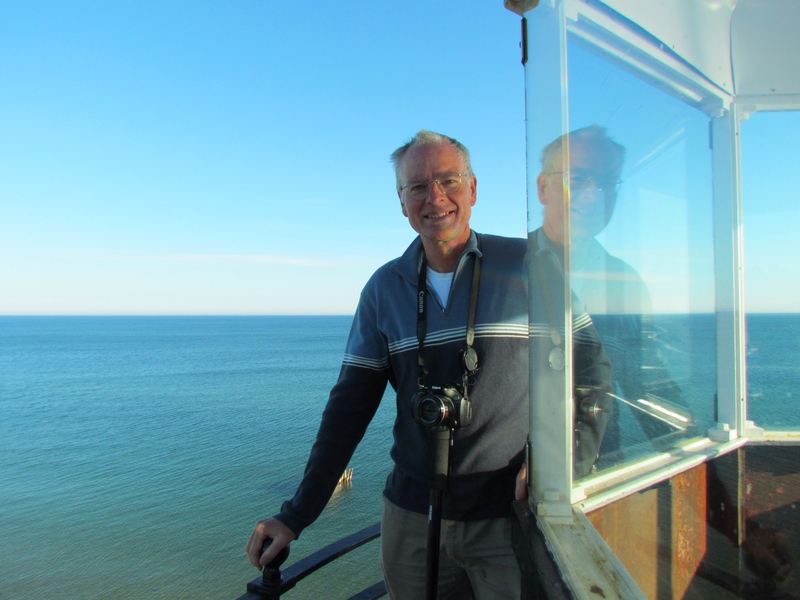 After nearly falling into disrepair with Lake Superior encroaching on its shoreline and lapping at its base, the lighthouse was saved by some enterprising folks who ultimately founded the Crisp Point Light Historical Society. That group has done extensive restoration and preservation work, ensuring the survival of the lighthouse for future generations to enjoy. Crisp Point Lighthouse is said to be a beauty. 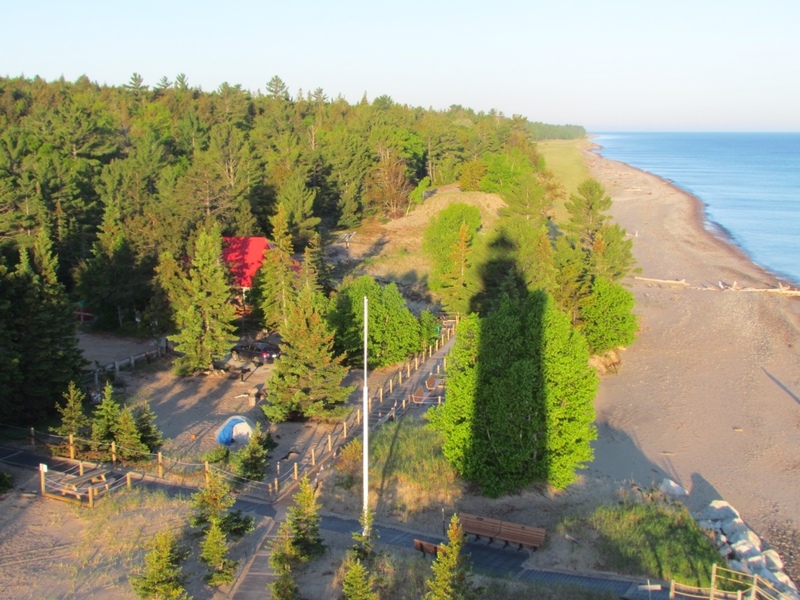 Its remoteness enhances the appeal of the site, with Lake Superior’s unspoiled shoreline providing a dramatic backdrop. Only the lighthouse remains of the multiple buildings that comprised the orginal complex. The attached service building was recently rebuilt, and a new visitor center resembles the old fog signal structure. Our gig is to man the visitor center and keep the buildings and grounds clean. We are expected to greet visitors and open the tower and gift shop from 10-5. Our instructions tell us we must “maintain the high standards of friendliness, neatness and cleanliness” in carrying out our duties. Just how many guests we will entertain is uncertain. 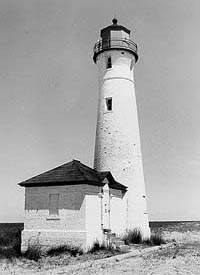 Given that the lighthouse is located at the end of an 18-mile dirt road in an already sparsely populated area, it is not a sight to attract casual tourists. But the true lighthouse affectionados will find their way there. Our accomodations on site will be a rustic campsite perched on the edge of Lake Superior. Devoid of running water, electricity and other amenities including cell reception, we will have to be self-sufficient for our 5-day stint. 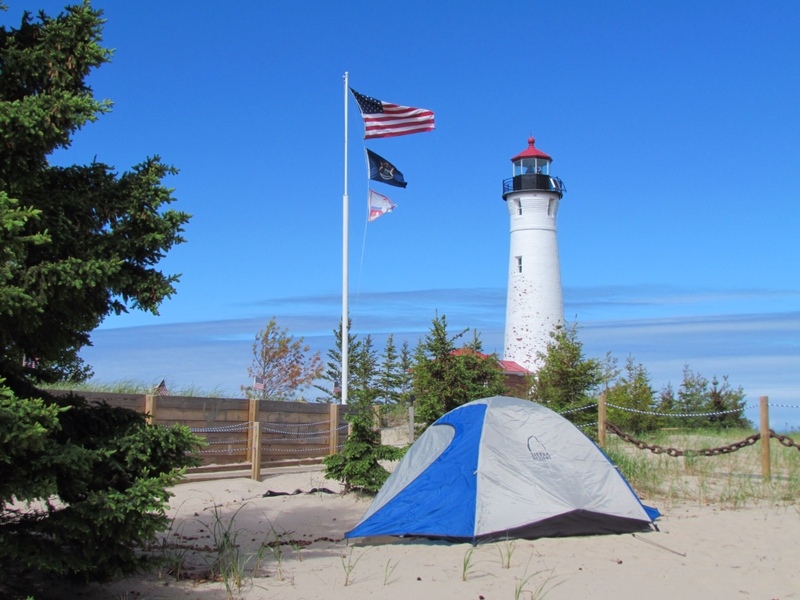 While it’s not required to stay overnight on the lighthouse grounds, to us that is the whole appeal. We even upsized to a 3-man pup tent for more elbow room, a luxury of car camping. Having our own slice of Lake Superior shoreline, sitting by a crackling campfire, reveling in the super dark night skies and the ever-hopeful possibility of Northern Lights are the draw for us. We should arrive at Crisp Point tomorrow morning about 8:00, in time to talk to the volunteers who are preceding us and get some pointers before assuming our duties at 10am. After that we will be out there on our own with little connection to the outside world, just like lighthouse keepers of old. Check back with us in about a week to see if we find ourselves fit for the job. Just four and a half months since we cycled to the end of our Grand Gaspé Cycling Tour, we are on our way to another new vacation experience. This time we have loaded up our cross-country skis and are headed for the Rockies. Although we won't be self-propelled between destinations this trip, we will be “self-supported” during our stay. With retirement comes plenty of free time, and an incentive to conserve funds. So when we heard about the volunteer opportunitites at Snow Mountain Ranch, a Nordic Ski Center run by the YMCA of the Rockies in Colorado, we didn't hesitate a moment before filling out the application. When the call came to say we were “hired” we were thrilled. We've never skied in the Rockies before, and are unlikely to spend the big bucks to go there, so it was the perfect solution. It's a sweet gig indeed. For three weeks we will work as volunteers for 28 hours a week, in exchange for room and board, and access to 100 kilometers of mountain ski trails. They are putting Rich to work in IT, doing a PC upgrade on all their computers. 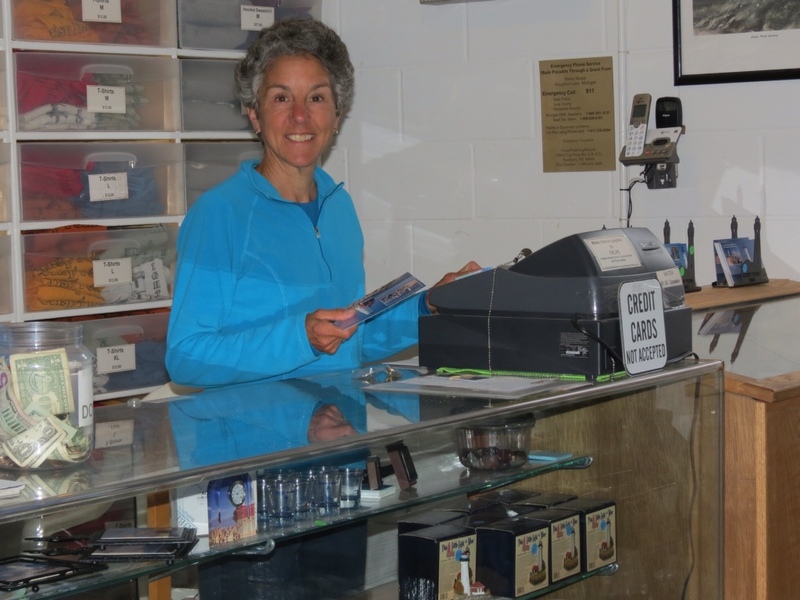 I chose a more leisurely pursuit – working in the craft shop, helping others with their projects. The remainder of the time we are free to enjoy the amenities of the center, most notably the ski trails. For a couple of XC skiing enthusiasts, what could be better? We have it on good authority that they treat their volunteers well, as they are the life blood of the operation. And in fact most of them return year after year. Some stay the entire winter, but newcomers like us are encouraged to try it out on a shorter term basis. I'm sure they will be checking us out as much as we are them. The staff accomodations are reported to be 60's style motel rooms – right up our alley having spent night after night in budget motels on our cycling trip. And someone else will be doing the cooking – sounds good to me. We check in tomorrow afternoon. Let the adventure begin! It was my first time volunteering to help build a house. I know nothing about construction, but I was warmly welcomed and put to work. 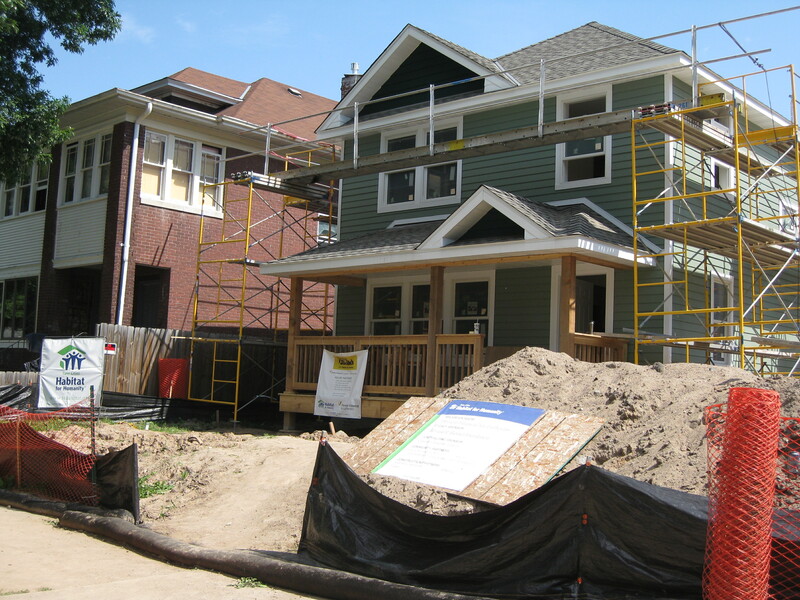 In this case, the project was nearing completion – after only 8 “volunteer weeks” the house was ready for indoor finishing work. I spent two and a half days wielding a paint brush, coating countless feet of trim and interior doors with coat after coat of semi-gloss paint. It was not exactly challenging, but it was work that needed to be done and it was a task that felt safe and comfortable for me. On my final afternoon, however, that changed. Without doubting my capabilities, the site supervisor assigned me and a young partner to trim the doorways. In no time, we were measuring, cutting, mitering corners and hefting powerful nail guns powered by compressed air. What looked so simple when he demonstrated for us took a lot more thinking on our parts, but we mastered it! And the result was not bad. I may have felt timid at first, but the resulting sense of accomplishment was the highlight of my tenure on that project. But I gained a whole lot more than that out of the experience. I learned that Habitat for Humanity is as much about the humanity as the habitat. Like most people, I did not really know how the organization operated. It’s not just building affordable houses, it’s setting up new homeowners to succeed. 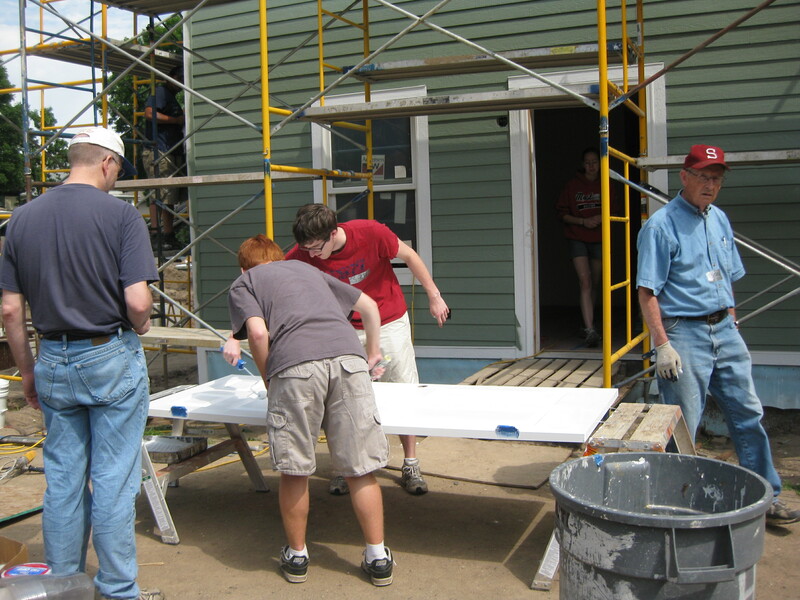 Habitat families must put in 300-500 hours of sweat equity, helping build their own home and other Habitat houses. They must meet specific income requirements, and qualify for their mortgage. They attend classes on managing their finances and home maintenance. It put the homes in a whole new perspective. But there was another side of the humanity. Working alongside other volunteers, I met people from a variety of backgrounds. We were encouraged to talk, take breaks and eat lunch together. Each day I partnered with different individuals, learning more about them through the course of our work day and I was inspired by their stories. I worked alongside a young woman who was just diagnosed with MS. Despite dealing with the side effects of her new medications and the lurking uncertainty over her future health, she worked tirelessly and eagerly. 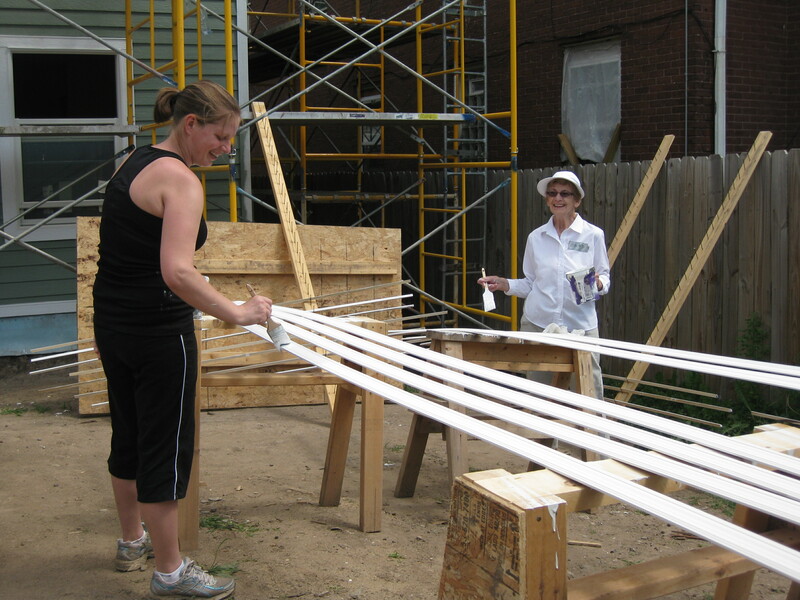 A young architecture student was putting in 8 weeks at Habitat this summer, gaining practical knowledge for her future profession. Retired folks were there for the entire week, some lending expertise from their former careers. One of them put in over 60 days on Habitat houses last year. One man took a day of vacation from his job to work with us. A Hmong brother and sister, college students, chipped in for a day. We were a motley crew, but made to feel appreciated. I wonder what I’ll learn next time?